A horticultural selection of Griseus horizontalis, this is one of the most commonly used California native plants. 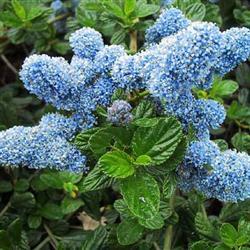 Yankee Point is a very garden tolerant spreading groundcover, with glossy green leaves and 1' blue flowers. On the coast it will take wind and salt spray, and it will do equally well inland. It is often used as a large-scale groundcover, and will stabilize slopes nicely. it reaches 2'-3' in heaight and spreads to 6'+.